McGill is launching its first #ConsentMcGill Campaign next week, from Oct. 20-24 at the downtown campus and Oct. 22-24 at Macdonald campus. The event is an educational campaign to increase understanding on campus of consent, as it applies to sexual activity and people's day-to-day lives. 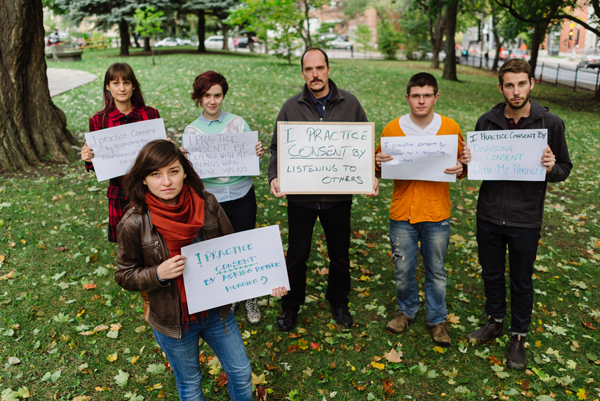 #ConsentMcGill will discuss the three main aspects of consent: Asking, Listening and Respecting one another. McGill is launching its first #ConsentMcGill Campaign next week, from Oct. 20-24 at the downtown campus and Oct. 22-24 at Macdonald campus. “The event is an educational campaign to increase understanding on campus of consent, as it applies to sexual activity and our day-to-day lives,” said Bianca Tétrault, McGill’s Harm Reduction Officer. “We developed this in collaboration with students, faculty and staff, and we expect that #ConsentMcGill will discuss the three main aspects of consent: Asking, Listening and Respecting one another,” she said. McGill Athletics and Recreation has joined in the effort by posting a terrific video (see below) about what consent means to McGill athletes. The weeklong campaign will feature special events including movie screenings, information booths, panel discussions and more. For those who are interested in volunteering, there is one training session left, on Friday, Oct. 17, from 6-7:30 p.m. Those interested in volunteering should fill out this form and organizers will get back to you with more specific information. If you have any questions please email healthymcgill.sexeducation@gmail.com or sarc.ods@mcgill.ca. Updates about the event can be found on twitter @ConsentMcGill and Instagram @ConsentMcGill. The schedules of events can be found on the #ConsentMcGill Facebook page.